1 large bunch loosely packed washed fresh dill, including about half the stems. Mustard Sauce (below) and sliced rye and pumpernickel bread for serving. Rinse salmon. Remove any of the small bones that you can in the fish, using tweezers. 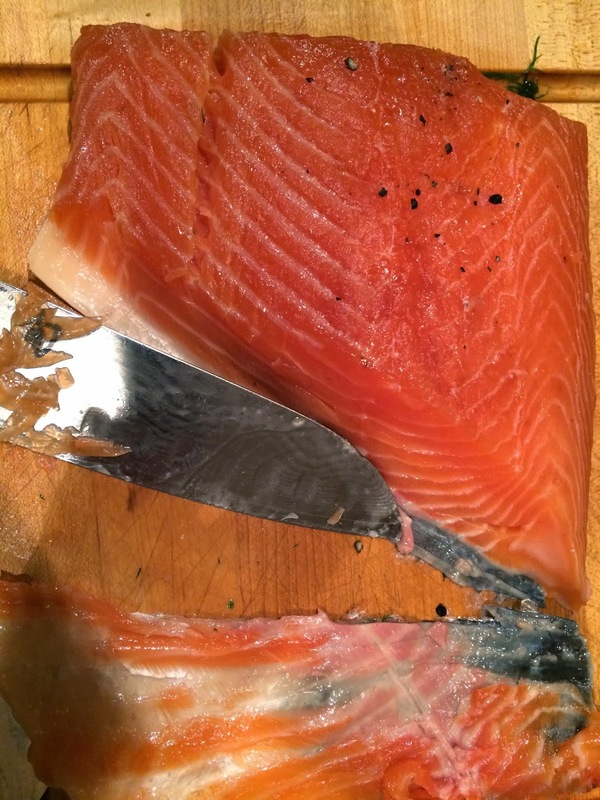 Place both pieces of the salmon, skin down on a double layer of plastic wrap. Mix sugar, salt, pepper. Sprinkle evenly on the salmon. Top with an even coating of dill. Carefully put the two halves back together, so that the dill/sugar/salt mixture is sandwiched in the middle. Cover tightly with plastic wrap, and then with foil, and if you like, put the whole thing into a plastic bag (the one the fish came in?) and close tightly. Put the package into the fridge, and and weight with a plate or small cutting board, and a brick, or some other heavy object (cans?). The more it is compacted, the better the texture will be. Refrigerate three or four days, turning it twice a day if you can, but I am not sure that turning it is really that important. After curing process, carefully open up the package, drain off the liquid. Salmon will look like this. 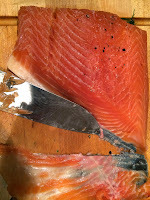 As you (slowly slowly) slice, using a sawing motion, arrange the slices on a platter, cutting off the skin as you go. Fish will keep for about 10 days, well wrapped in the refrigerator. Mix together, put in pretty bowl.